Lang ist der letze größere Beitrag her und das wird sich leider auch mit diesem nicht ändern oder doch? Nein ändern wird sich das nicht den ich arbeite sehr hart am neuen Design des Blogs und werde erst nach der Fertigstellung mehr auf die Tasten drücken, aber keine Sorge es ist bald soweit und bis dahin werde ich einige Sushi’s veröffentlichen. Obwohl ich die Zeit für lange Beiträge nicht habe, möchte ich heute nicht einfach nur ein Video posten. Die in Krakau ansässigen Visualisten Elwira Wojtunik und Popesz Csaba Láng haben auf dem B-Seite Festival in Mannheim eine atemberaubende Live Cinema Performance aufgeführt. Diese hat mir so sehr gefallen, dass ich mehr Hintergrundinformationen wissen wollte. Von daher folgt dem Sushi ein Interview des mehrfach prämiierten Visualistenduo, die eher als Elektro Moon Vision bekannt sind und gemeinsam seit dem Jahr 2004 internationale Leinwände bespielen. Bilder sollten nicht mit Worten umschrieben werden (zumindest dann nicht, wenn diese gesehen werden können), daher folgt ein roher Ausschnitt ihrer neuen Performance – ein Sushi eben. Und nun viel Spaß mit „Underconstructions“! 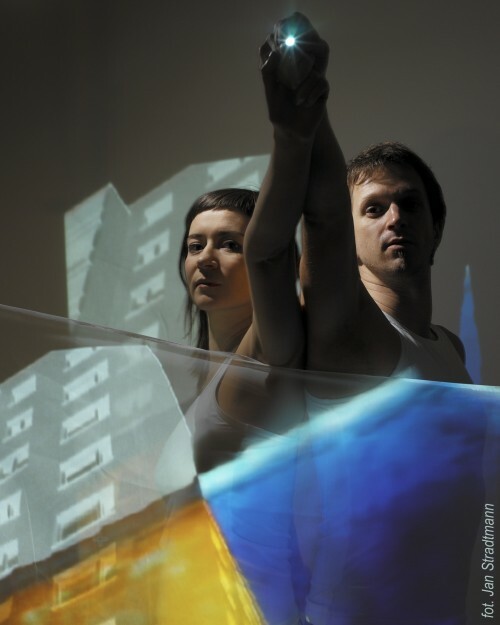 A: At the B-Seite festival you screened the AV performance ‚Underconstructions‘. What does the title mean? 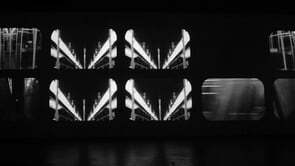 E: The title ‘Undeconstructions’ refers to the subject of the performance which is inspired by the architecture of the underground, but also to the process of creating the performance, which was under-construction for quite long time. A: Does the performance contain a message? 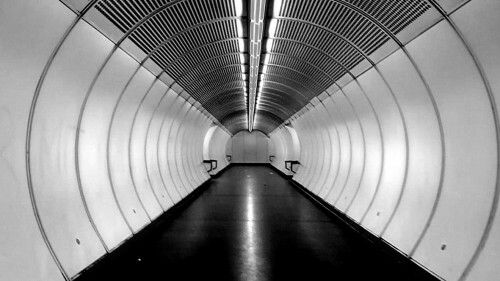 E: During the performance we focus on the underground traffic system, in accordance to its unique way of transiting in space and time. Translocating by metro creates a specific suspension between time and space – this every-day experience makes the fact unconsidered as a journey, much more as a quick transfer from point A to point B where the movement is reduced to the reflection only of the aiming destination and the trip itself is a blank space without the visual relation to the landscape. A: The performance contains of self made footage. How did you produced it? E: Yes, it’s 100% self made footage I shot in the Viennese underground. I noticed this space from the very first moment I visited this city, but the proper time came in 2010 when I was granted with artistic residency at MuseumsQurtier in Vienna. I was going to the metro constantly every night just an hour before closing to catch the specific spaces empty, which wasn’t easy – metro in Vienna is quite crowded, there is more than 1 million passengers using it every day. So it took some time to get the desired atmosphere and the pictures which emphasize this impressive architecture there. During the night it’s also very unique atmosphere under the ground in such futuristic areas – that was very important for me in the process of creating this project. A: Did you had difficulties during the production of it? E: People using the metro were my enemies:) And security of course. As I didn’t go by the official way with permissions to shoot in the underground sometimes I was disturbed by the security, but after quick explanations they normally left me alone. Forgetting about time – closing time – was quite funny, while I had to leave the underground and use another public transportation during the night being on the other side of the city. A: Where and how do you get inspiration for your projects? E: It’s hard to say. I just observe the world and people around me and when there is something which arouse my interest I put it into the complex net of ideas in my head. A: What advice would you give to AV beginners? E: Well, for me it’s important to be very deep in the project, the best footage without personal feelings of the performer will be not worthy too much. If you perform as a team it’s very important to understand each other. A: Thank you for the nice interview!